We can now enjoying the benefits of having running hot and cold water in our kitchen once more, as the handyman showed up as scheduled to replace the tap with a shiny new one. We have actual water pressure when we turn the tap on now and last night Dave spent most of the evening marveling about how quickly the sink fills up. The whole job took a couple of hours and was without drama's other than me discovering the tardis like properties of the cupboard under the sink. I seem to have been collecting dusters, and sponges in there, so many that I had my doubts I could get them back in again when it came to putting things away. While the handyman was on site, I quizzed him about woodburners (which he didn't know anything about) and escorted him to the end of the garden, to get his opinon of the area behind the shed. This is the forgotten end of the garden, currently hidden by the shed but a traditional dumping ground for rubbish by the previous owner and it seems, our neighbours. We spent a good six months clearing about half of it several years back and I'd like the rest of it cleared, not least because it would discourage said neighbours from thinking they can throw anything they like there. The handyman stood there looking a bit flummoxed until admitting that he couldn't see any other way to clear it than to do it manually by hand as he wouldn't be able to get a small digger in there. His verdict was that there was at least a couple of skips worth still buried in that patch and it would take a lot of effort to get it out. Hmmm... Not exactly what I wanted to hear. In other news, I think I'm about to rip out my Jaywalker sock and here is a picture of it, showing my progress so far - just for the record. I'm not happy with it. I miscounted the stitches somewhere in amongst the increases and decreases that make up those chevrons and for the life of me I can't see where. On top of that, the sock is eating yarn at an alarming rate and I don't think I'm going to have enough left to complete the sock. If I do manage it, there is no way I'll be able to match up stripes because I won't have enough length to play with and of course, because of the mucked up stitch count I'm doubtful the colour bands will match anyway. Then there's the fit at the heel... Having been warned that the Jaywalker is notoriously tight, imagine my surprise when the turned heel and gusset actually appears to be a bit loose! Not much mind, so maybe knitting it with the correct number of stitches will correct it. If not, perhaps I need to knit the foot in the next size down. The final nail in the coffin - having tried the sock on I'm not happy with the cuff which doesn't seem to fit at all. Rather than cling nicely to my calf, it just sort of hangs there loosely and is clearly too big for my leg and I don't exactly have skinny legs. Years of walking, vigourous exercise and being a fairly active adult mean that I have muscles in my legs even if I don't have them anywhere else. 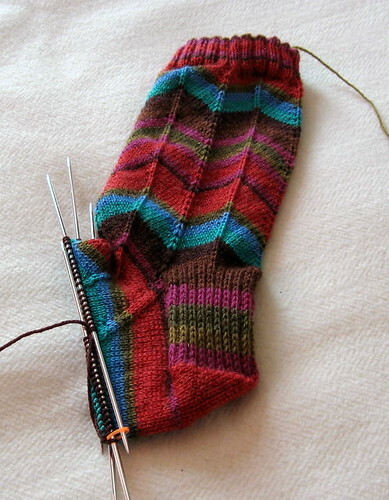 I could persevere and hope I have enough yarn to finish the sock, but I'd know it's a bodge. I'd know that cuff doesn't remotely fit even if it is covered up by my trousers and I don't intend them to be house only. If I go to the bother of knitting a pair of socks, while they don't need to be perfect, they do need to at least fit vaguely and be wearable. So my plan... I'm going to rip that sock out and start again, this time casting on the cuff in the next needle size down. 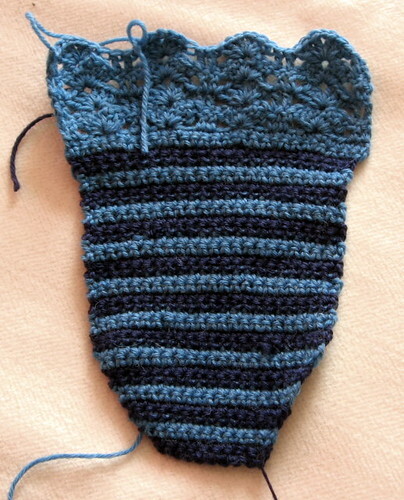 Once I'm off the cuff, I'll go up a needle size for the rest of the sock. I'll shave an inch off the length of the leg too, which should hopefully give me a little more confidence that I'll have enough yarn to finish the sock. That bit behind the shed sounds costly in skips alone, something to tackle a bit a time, but worth tackling. So did you start the sock again? Oh no! There's nothing worse than having to rip out a project.... except maybe finishing it and regretting it. I'm currently failing at finishing socks. And posting about them. And photographing them.